Cincinnati, Ohio — Leaders throughout Memphis, Tenn., are helping students complete their FAFSA forms to increase the total number of college attendees in the region. School officials and community leaders in Austin, Texas, are using community and family engagement to boost attendance rates throughout the city. And leaders from healthcare and education in Minneapolis-St. Paul, Minn., are joining forces to offer health screenings to 3-year-olds that offer insight into kindergarten readiness. These and many more stories will be shared at the sixth-annual national StriveTogether Cradle to Career Network Convening, “Mission Possible: Agents of Transformational Change,” from Oct. 7-9 in Minneapolis, Minn.
Based on the conference theme, more than 350 educators, elected officials, community leaders, business executives, nonprofit professionals and policymakers have accepted a mission to improve education for every child throughout their communities. The StriveTogether Cradle to Career Network brings together cross-sector leaders who are committed to improving education outcomes for kids. Representing more than 60 community partnerships in 32 states and Washington, D.C., attendees at the sold-out event will share their work to unite communities around shared goals, measures and results in education. StriveTogether’s Cradle to Career Network connects more than 9,600 organizations throughout more than 60 partnerships. Together, the Network impacts more than 8.2 million students. Earlier this year, Minnesota legislature voted to invest $6 million over the next two years for operation and pilot funding in education partnerships throughout the state, including three StriveTogether collective impact communities. The policymakers were especially drawn to the partnerships’ use of data to make decisions, work toward educational equity and focus on community engagement, as well as their sustainable achievements in improving student outcomes. During the convening, Edmondson will give the opening plenary with representatives from Target, Minneapolis Public Schools, the Carlson Family Foundation and the Minneapolis/St. Paul Cradle to Career Partnership, Generation Next. 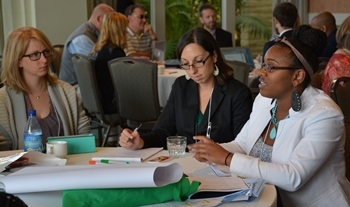 Throughout the three days, attendees will explore and discuss education equity, continuous improvement, community engagement and other topics that directly affect their work.